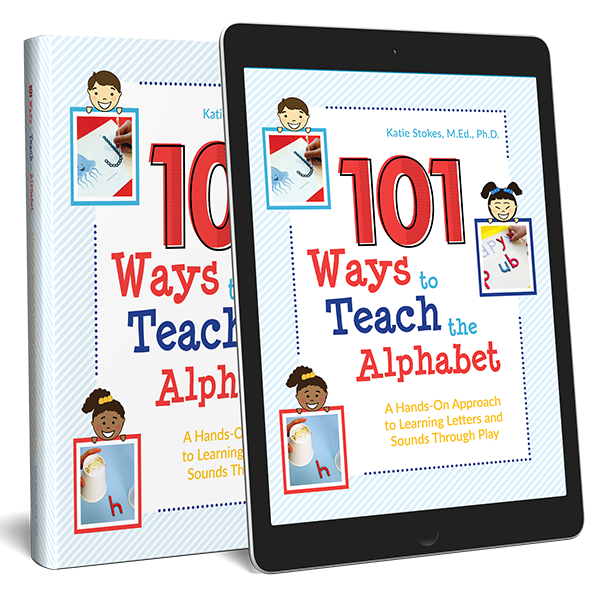 The next installment in my 101 Ways to Teach the Alphabet Series combines letter learning with fine motor skills practice. 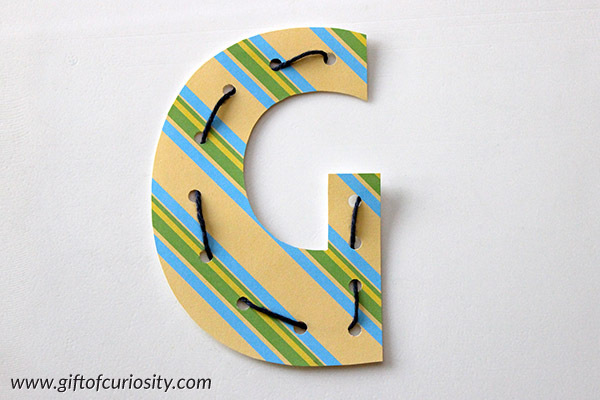 Letter lacing is a great activity for toddlers and preschoolers alike. 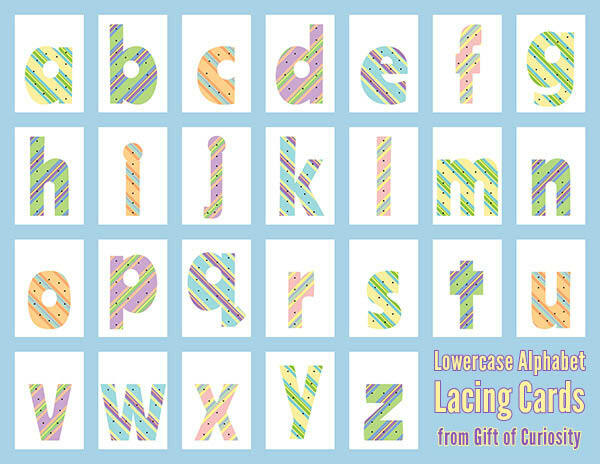 And today I’m making it easy by sharing my free printable alphabet lacing cards. 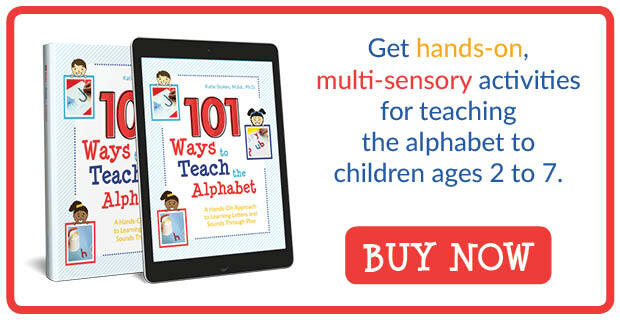 Click here if you want more information about teaching the alphabet in a fun, hands-on, and multi-sensory way. 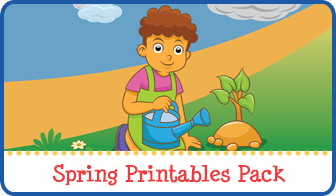 A lot of kids go through a developmental phase where they love lacing activities. When a child is ready for this kind of work, he or she will show a lot of concentrated effort to get the lacing of the letters just right. 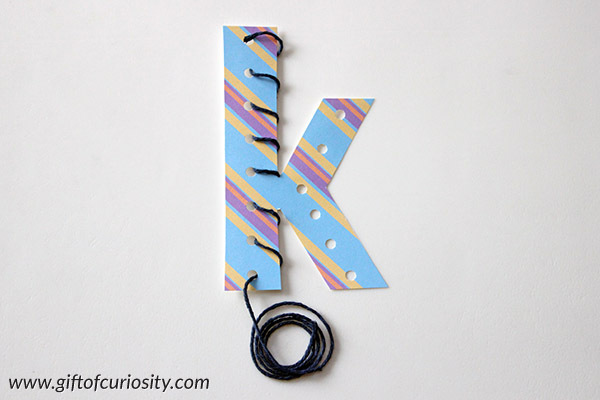 For this activity, all you need to do is prepare some letters using my Alphabet Lacing Cards set, and then give them to your child along with a string. 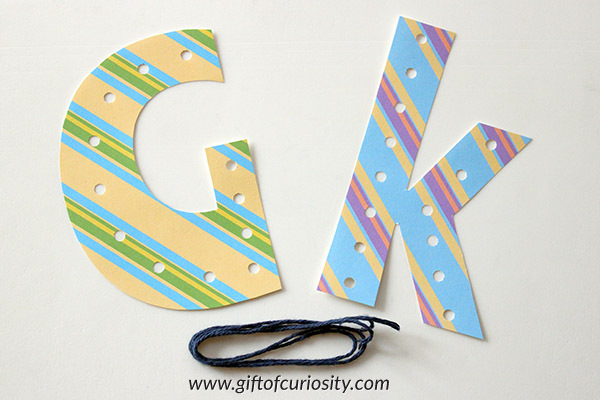 Show your child how to thread the string through the holes in the letter. You may want to wrap a small piece of scotch tape around the end of the string to prevent it from fraying and to make it easier for your child to get through the holes. 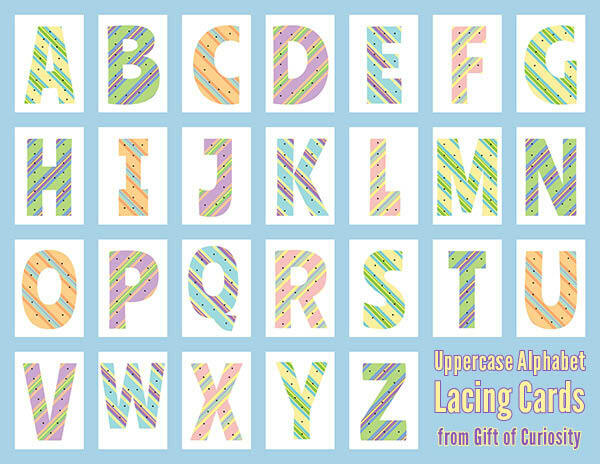 Allow your child to lace the letters with whatever style of stitch or or she prefers. The final “look” of the stitched letter is less important than your child’s sense of accomplishment and his or her opportunity to experience the shape of each letter in a very hands-on way. 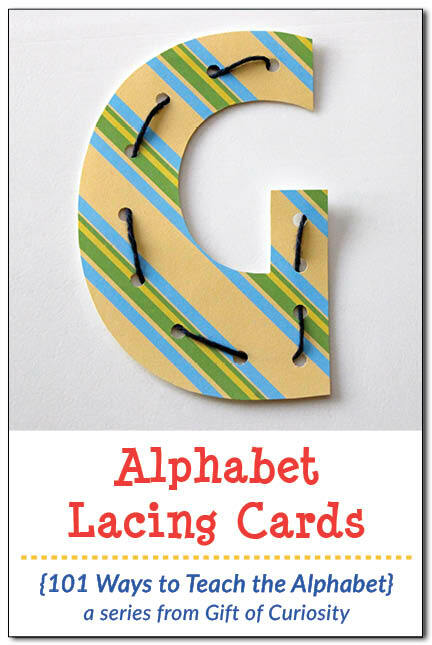 There are commercial alphabet lacing card products you can purchase (see here and here), although both sets I linked to only include uppercase letters. 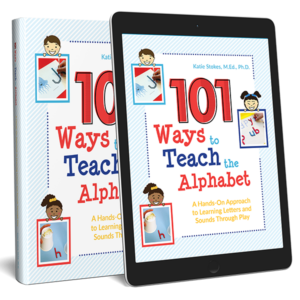 Have questions about teaching the alphabet? We’ve got answers! Click here to learn more. 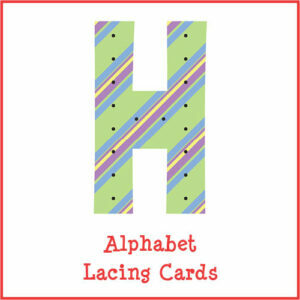 Want a copy of my Alphabet Lacing Cards? 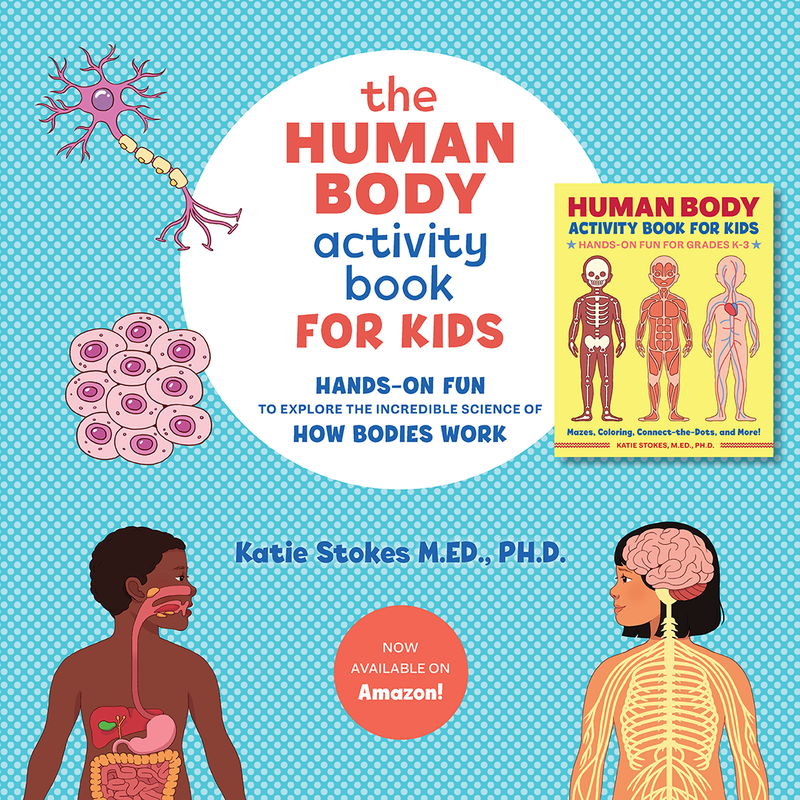 Or get it with your purchase of 101 Ways to Teach the Alphabet. 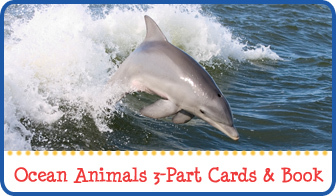 You can find more ways to teach the alphabet on my Literacy Activities for Kids page and my Letter Learning Pinterest board. 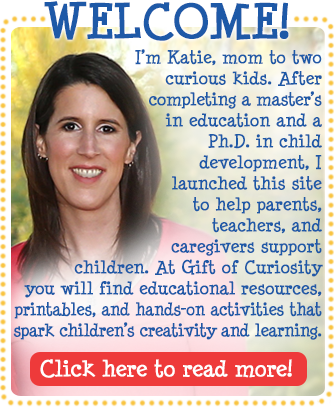 Follow Katie @ Gift of Curiosity’s board Learning Letters on Pinterest. UN très bon travail, merci ! Thank you so much!! I have been searching for something just like this!